WEN has actively supported and promoted community food growing, recycling, waste reduction and gender equality in Tower Hamlets for 15 years. As an organisation working at a very local level with people, we have observed first-hand the positive effects of food growing spaces on individuals and communities. We strongly believe that the importance of community food growing should be recognised in local, national and even international policies and therefore felt the need to share our thoughts and experience in our contribution to Tower Hamlet’s new Local Plan. The Local Plan sets out the general policies for the future development of an area and must go through the process of “effective discussion and consultation with local communities, businesses and other interested parties”. It is in this context that the Tower Hamlets Council called for participation in a document called: “Our Borough, Our Plan: A new Local Plan first steps”. At WEN we seek to express our views and to encourage our own members to feel empowered enough to share their own. This is an opportunity for locals to feed in with first-hand knowledge and experience with policymakers. 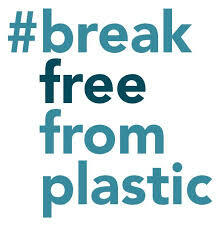 If you feel this concerns you, participate! – submissions are open until Wednesday 8th February on the Tower Hamlets website. 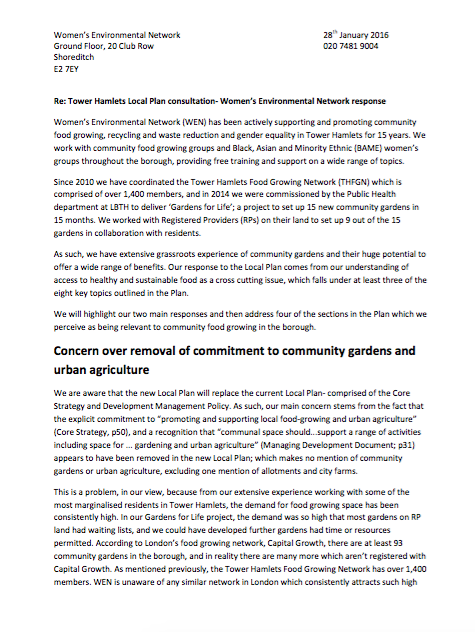 The new Local Plan lacks an explicit commitment to promoting and supporting food-growing and urban agriculture in the borough, failing to acknowledge the consistently high demand for food growing space which WEN experienced in the process of carrying out the ‘Gardens for Life’ project. As we expressed in the paper, the importance and interest triggered by these spaces can hardly be ignored – there are currently over 93 community beds in the borough and over 1,400 subscribers to the Tower Hamlets Food Growing Network. Spaces for food growing and urban agriculture promote health, wellbeing and are of considerable social value: reducing isolation among vulnerable people and creating opportunities for interactions across generations, cultures and class. They are an asset to local communities and should be cherished as such, also promoting more sustainable practices: reducing CO2 emissions by creating a culture of locally grown food, and improving waste management by encouraging on-site composting practices. Food growing is empowering for individuals and for the communities they belong to. Support us in conveying this message to the Tower Hamlets Council by sharing your comments before Monday 8th February 2016. ... and find out more about WEN's local food projects on our dedicated page. A BIT MORE POLICY: WEN is also concerned with the future of local food on a city scale and was invited by the CFGN to speak on ‘The Future of London’s Food’ panel at City on Thursday 4th February 2016. More details here.